In today's work environment, companies need to accomplish tasks faster. Modern forms of work have made it possible to work effectively and efficiently anywhere and at any time. 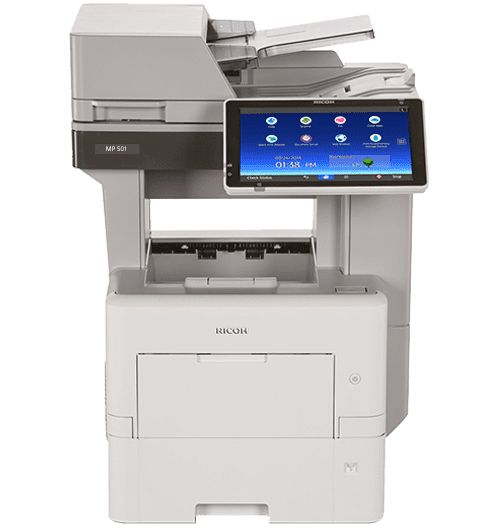 In line with this trend, Ricoh has launched a Workplace Innovation Technology, the next generation of office automation. The new RICOH MP 501SPF / MP 601SPF Smart Operation Panel simplifies printing, scanning and other collaborative processes. Workbench Technology Technology enhancements make mobile access and printing capabilities possible, helping to increase overall office productivity. It also makes common tasks faster and easier, making it easier to use the most frequently used functions and saving pre-defined document settings for repeat use. These features work together to create a seamless and seamless collaboration experience. Choose the best Multifunktionsdruckerkonfiguration for your needs. Our Signature series is designed with the most popular combination of features and benefits, allowing you to choose the best multifunction configuration for your business needs. Choose from a basic model that you can fully configure yourself, or save time and rationalize the installation with the MP 501SPF essential, plus or performance models. With a higher print speed of 50 pages per minute and a large 10.1-inch smart operation Panel, you get compatibility and commonality with other Ricoh devices. But what is perhaps more important is the sheer variety of work you can do, including the ability to take complex tasks much more efficiently. And when combined with a small footprint and a long service life, you get a printer that grows with you when your business grows. Keep track of who is using the device and what you are doing. With user authentication, each user logs in with a passcode or billing code. Or you can add an optional NFC card reader and have it wiped by an ID card. Control costs with pressure quotas. You can even combine it with an optional accounting software such as the Ricoh Device Manager NX Accounting to post chargebacks. Protect information with locked print, which stores jobs in the queue until you release them for sharing. The MP 501SPF has a low power consumption (TEC), is ENERGY STAR ™ certified and meets the EPEAT ® silver criteria. It also includes standard duplex printing to reduce paper consumption. Distribute important information with unparalleled reliability. Use the rich consumables to minimise the supply costs. Operate the MFP almost maintenance-free to ensure optimum productivity for the entire life of the device. Impress your audience with a print resolution of 1200 x 1200 dpi, even on thicker paper stocks up to a weight of 120 lb. Insert paper up to a size of 8.5 "x 14" in one of the paper sources, or use the 100 sheet bypass for specialty media. With the hard drive (HDD), you can create a server-like hub to store documents for fast on-demand printing. Use the optional optical character recognition (OCR) scanning to retrieve documents using keywords. Connect to an additional network at the same time using an optional second network interface. Keep pace with increasing workload without compromising your space or budget. Place the compact MP 501SPF in your cabinet or work center and perform everyday tasks on Mac ®, Windows ®, and host printing environments. Add up to four additional paper sources and extend your paper capacity to up to 2,600 sheets in shared areas with even higher workloads. Set links to digital workflows to reduce manual steps. Download information-rich widgets or workflow apps from the Lanier application site and place them directly on the home screen for instant access. Use one-touch control to access key features, including common tasks such as ID card copy. Inform your target group immediately. Access files from your document server, the cloud, a smartphone or tablet, and print up to 52 black-and-white pages per minute (ppm). Download the Ricoh Smart Device Connector app and the Ricoh app for Google Cloud Print to your smartphone or tablet and print it without any drivers, utilities or software. Share information instantly with multiple scan-to options and automatic automatic template indentation (ARDF). or opt for paperless faxing to send and receive contracts, invoices, and other forms directly from your email. Use the WorkStyle innovation technology to integrate different processes and simplify complex tasks. Choose which icons, options, and features appear in your personalized user interface. Use the usual flicks for tapping, scrolling, flicking and scrolling to navigate tasks and find information faster than ever, even online with the integrated web browser of the MFP.